KALPITIYA, Sri Lanka, Jun 17 2015 (IPS) - Weekends and public holidays are deadly for one of Sri Lanka’s most delicate ecosystems – that is when the island’s 8,815 hectares of mangroves come under threat. With public officials, forest rangers and NGO workers on holiday, no one is around to enforce conservation laws designed to protect these endangered zones. Except the locals, that is. Residents of the Kalpitiya Peninsula in the northwest Puttalam District are no strangers to the wanton destruction of the area’s natural bounty. Kalpitiya is home to the largest mangrove block in Sri Lanka, the Puttalam Lagoon, as well as smaller mangrove systems on the shores of the Chilaw Lagoon, 150 km north of the capital, Colombo. For centuries these complex wetlands have protected fisher communities against storms and sea-surges, while the forests’ underwater root system has nurtured nurseries and feeding grounds for scores of aquatic species. 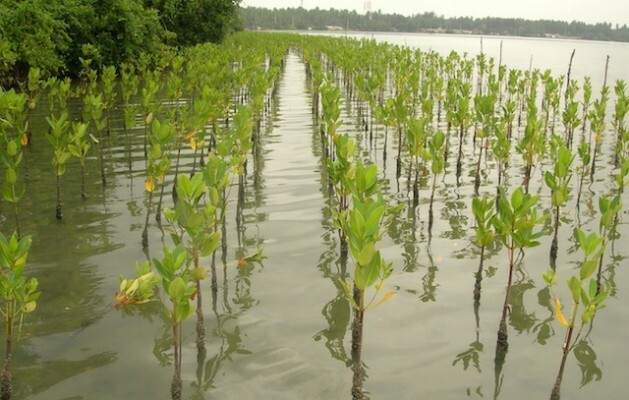 Perhaps more important, in a country still living with the ghosts of the 2004 Asian Tsunami, mangroves have been found to be a coastline’s best defense against tidal waves and tsunamis. 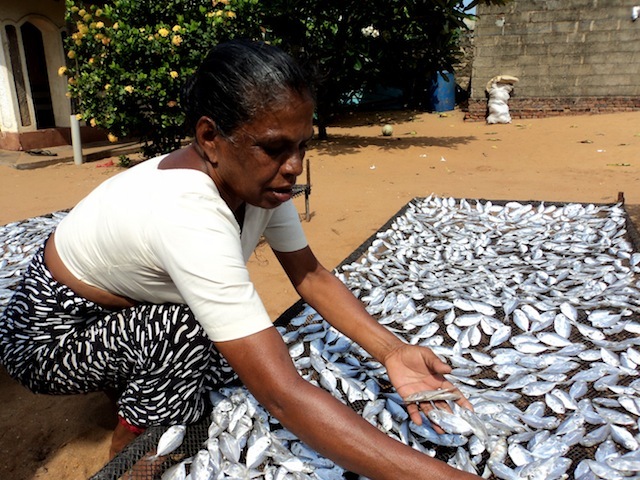 Many poor fisher families in western Sri Lanka also rely heavily on mangroves for sustenance, with generation after generation deriving protein sources from the rich waters or sustainably harvesting the forests’ many by-products. But in Sri Lanka today, as elsewhere in the world, mangroves face a range of risks. The United Nations Environment Programme (UNEP) says that the unique ecosystems, capable of storing up to 1,000 tonnes of carbon per hectare in their biomass, are being felled at three to five times the rate of other forests. Over a quarter of the world’s mangrove cover has already been irrevocably destroyed, driven by aquaculture, agriculture, unplanned and unsustainable coastal development and over-use of resources. On the west coast of Sri Lanka, despite government’s pledges to protect the country’s remaining forests, the covert clearing of mangroves continues – albeit at a slower rate than in the past. But a small army of land defenders, newly formed and highly dedicated, is promising to turn this tide. They call him the ‘Mangrove Master’, but his real name is Douglas Thisera. 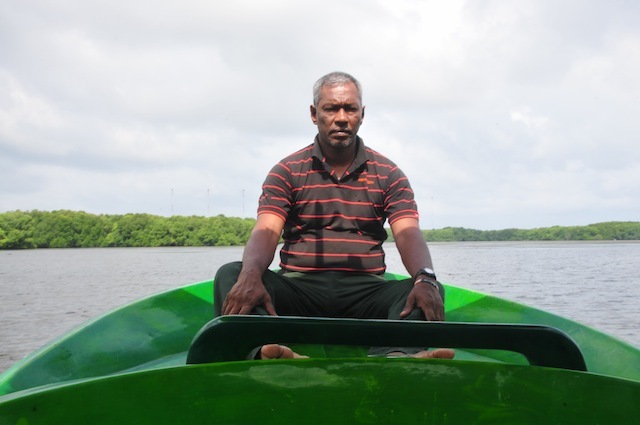 A fisherman turned vigilante, he is the director for conservation at the Small Fisheries Foundation of Lanka (Sudeesa) and spends his days patrolling every nook of the Chilaw Lagoon for signs of illegal destruction. Last month, the Sudeesa programme received a massive boost from the U.S.-based NGO Seacology to expand its operations island-wide. The Sri Lankan government also signed on as a major partner for the five-year, 3.4-million-dollar mangrove protection scheme. The project will use Sudeesa’s original initiative as a blueprint to pair conservation with livelihood prospects on a much larger scale. The plan is to provide assistance to over 15,000 persons, half of them widows and the rest school dropouts, living close to Sri Lanka’s 48 lagoons where mangroves thrive. There will be 1,500 community groups who will look after the mangroves and also plant 3,000 hectares’ worth of saplings. In a further boost to conservationists, on May 11 the Sri Lankan government declared mangroves as protected areas, bringing them under the Forest Ordinance. The move now makes commercial use of mangroves illegal, and the government has pledged to provide forest officials for patrols and other members of the armed forces for replanting programmes. This is a huge step away from previous governments' policies and reflects a commitment from the newly-elected administration to conservation and sustainability - both priorities at the international level as the United Nations moves towards a pot-2015 development agenda. “We can dream big now,” says the Mangrove Master, scanning the horizon. He has been replanting and conserving mangroves since 1992, so he knows these forests – and its enemies – like the back of his hand. “Suddenly we will see earth movers and other machinery clearing large tracts of mangroves – by the time pubic officials are alerted, the destruction is already done,” he tells IPS. This pattern follows decades of state-sanctioned deforestation that began in the early 90s, when an aggressive government-backed prawn-farming scheme was taking root around the lagoon and private corporations as well as politically-linked business enterprises were eyeing and clearing the mangroves indiscriminately. For years Thisera tried to draft the local community into conservation efforts, but they were up against a Goliath. By 2012, prawn farming, salt panning, solid waste disposal and hotel construction for the country’s thriving tourist sector had conspired to cut Sri Lanka’s mangrove cover by 80 percent, according to some estimates. Today, under the aegis of a major mangrove conservation programme in the region, Thisera not only has financial backing for his efforts – he has a network of residents just as dedicated to the task as he is. The project is led by Sudeesa, whose chairman, Anuradha Wickramasinghe, believed that only “community-based” action could hope to save the disappearing forests. But this was easier said than done. Poverty stalks the population of Sri Lanka’s northwest coast, and the most recent government statistics indicate that the average income among fisher families is just 16 dollars a month, with 53 percent of the population here living below the national poverty line. Unemployment is roughly 20 percent higher than the island-wide average of 4.1 percent, and most families spend every waking moment struggling to put food on the table. So Sudeesa created a micro-credit scheme to incentivize conservation efforts, and tailored the programme towards women. Women are offered a range of loans at extremely low interest rates to start home-based sustainable ventures. In exchange, they care for young saplings, help replant stretches of mangrove forest and take it upon themselves to prevent illegal clearing for commercial purposes. Together they have planted 170,000 saplings covering an area of 860 hectares in the district – and they are working to multiply this number. The entire scheme relies on community action. Women are put in charge of designated locations, mostly close to their homes. When encroachment or illegal harvesting takes place, they use local networks and cell phones to get the word out. Here, the Thisera plays a pivotal role, acting as an intermediary between local watchdogs and networks of public officials, which he can activate when the women raise a red flag. Last year this rudimentary conservation machine managed to halt encroachment by a private company with a stake in prawn farming by forcing it to dismantle fencing around the mangroves and retreat to demarcations laid down in government maps of the area. Thisera says powerful business interests present the biggest menace to locals. Although an epidemic in the late 1990s decimated most of the prawn farms, leaving large, empty man-made tanks in place of mangrove ecosystems, companies have been reluctant to retreat and many continue to pay taxes on former areas of operations. “They want to keep a legal hold on the land for other purposes,” Thisera explains, such as tourism on the northern ridge of the Puttalam Lagoon that has seen a revival since the end of the country’s civil war in 2009. Already two islands have been leased out to private companies, though no major construction operations have yet begun. When they do, however, they will be forced to reckon with Thisera and his unofficial rangers. Cut off from the country’s commercial hubs and major markets, women in this district have long had to rely on their wits to survive. Take Anne Priyanthi, a 52-year-old widow with two children who until three years ago had struggled to feed her family. She tried to lift herself out of poverty by applying for a bank loan – but was refused on the basis that she did not “meet the criteria”. In 2012 Sudeesa granted her a loan of 10,000 rupees – about 74 dollars – which she used to start a small pig farm. Today, she earns a monthly income of 25,000 rupees, or 182 dollars. It seems a pittance – but it means her kids can stay in school and in these impoverished parts that is a monumental success. Another beneficiary of Sudeesa’s conservation-livelihood project is 58-year-old Primrose Fernando, who now works as a coordinator for the NGO. The widow has three daughters, one of whom has a minor disability. With her loan she was able to set up a small grocery shop for the disabled daughter and also invest in an ornamental fish breeding business. “Without this assistance I would have been left destitute,” Fernando tells IPS. Since 1994 Sudeesa had given out loans to the tune of 54 million rupees (over 400,000 dollars) to 3,900 women in the Puttalam District. Officials say that the loans have a repayment rate of over 75 percent. Now the loans scheme falls under a registered public organisation called Sudeesa Social Enterprises Corporation, of which 683 of the most active women are shareholders. “It is the shareholders who run the orgainsation now, who decide on loans, repayments and follow-up action in case of defaulters,” explains Malan Appuhami, a Sudeesa accountant. The operation is not your average micro-credit scheme – interest rates are less than three percent, and since the women are all part of the same community, they are more interested in helping each other succeed than hunting down defaulters. For instance during the months of June to September, when rough seas limit a fisher family’s catch, the shareholders create more flexible repayment plans. In a country where the female unemployment rate is over two-and-a-half times that of the male rate, and almost twice the national figure of 4.2 percent, the conservation-livelihood scheme is a kind of oasis in an otherwise barren desert for women – particularly older women without a formal education, as many in the Puttalam District are – seeking paid work. Suvineetha de Silva, a Sudeesa credit officer, tells IPS that there has been a visible shift in women’s outlooks and attitudes – no longer ragged and shy, they now ripple with the confidence of those who have taken matters into their own hands. Some have even been able to send their kids to university, de Silva says, something that was “unheard of” a decade ago, when the simple act of completing primary school was considered a luxury for youth whose parents needed the extra labour to help feed the family. Other women are spending more time at home, with the result that sustainable cottage industries like home bakeries, dress making ventures and even hairdressing operations are thriving. Best of all is that Puttalam’s mangroves now have a fighting chance, with determined women keeping watch over them. Globally, an estimated 100 million people live in the vicinity of mangrove forests. What would it mean for the future of biodiversity if all of them followed Sri Lanka’s example? Good job. There are other countries too where multiple management of mangrove forests are done more for protection and production and improved sustenance of local communities such as in VIetnam and Indonesia as well as for export too earn precious foreign exchange. Perhaps Mr. Tissera should go and see those areas and adapt to local situations. That will be a way forward. Mangrove forests also exist in other districts in SL where there is plenty of scope for joint management with local communities and thus lift their economic potential. Sole protection alone is not really necessary. I would like to know the situation of mangroves left in the Northern and Eastern coasts after the war with the location of a large number of army and navy camps along the coasts.